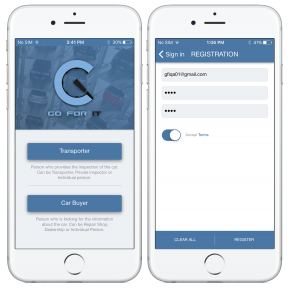 By GOFORIT application the Car Buyers can get the most independent, scrupulous and recent information about the cars that they are interested in. Please check these steps to learn how to work and use GOFORIT for your success. When you open the application for the first time, please chose the “Car Buyer” mode. This mode will be saved for the future sessions. Fill the registration form by adding Email and Password. Check your email for the activation link and press it. Press “Done” button in the message. If you’ve been pressed the link before you’ve press “Done” button, you will be forwarded to the Home Page. Enter a VIN number or other info (Make/Model/Year/Location) on the Search field and press “GO”. In the list of the results please press on the car you want to check. Check what information you can purchase by clicking on the different segments of the Polygon. On the left top side, you will see amount of photo/video that this car has in our database. Each “click” will add or remove this segment from your shopping bag. So, you can purchase only the information you really need. For example, if you are interested only to get additional info about the engine and Interior: add Engine segment to the scope and add a check-mark to the Interior section. The price will be corrected automatically accordingly to your selection. Our suggestion: in case you want to check the exterior (outside damages) always choose the Inspection segment as this is the most full and accurate inspection of the exterior parts of the car. When you choose needed segments press “Purchase” button, and follow the instruction. 6. After this, you will see similar page with Polygon on it, but this time bought Polygon’s segments will show you Photos or Videos or other information that we have in our database about the selected segment. IMPORTANT NOTICE: We do not guarantee that information about some part will be full or accurate. We are using third party sources to get this information. If you are not satisfied with the accuracy of the information, please rate the inspector accordingly. Use the rating indicators to purchase the information only from high rated inspectors. 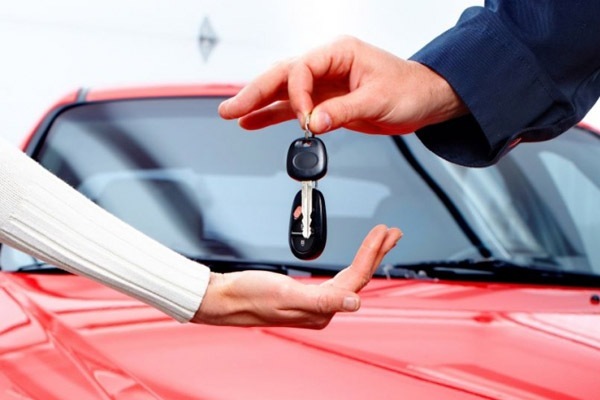 Also, if you are satisfied with the accuracy of the information, please rate the Inspector accordingly – it helps us and other Car Buyers to understand the level of Inspector’s reliability. All purchased earlier cars will be in your History Page. You can review the information about them by clicking on particular car in the History. 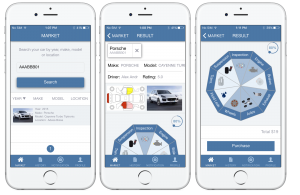 One of the most useful features for car buyers is our Notification page which helps to understand when there is a great cars to match customer’s needs. 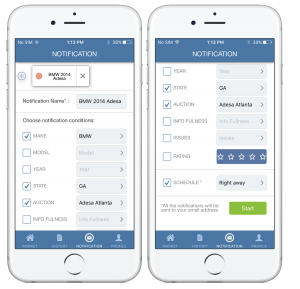 Users will receive a notification email when Press the Notification button. 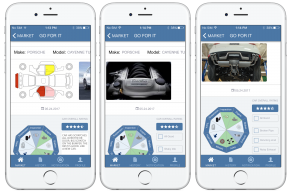 GOFORIT is a simple application that in one hand helps the Transporters to provide car inspections and from another hand helps the Car Buyers to get independent opinion about the cars that they want to buy.